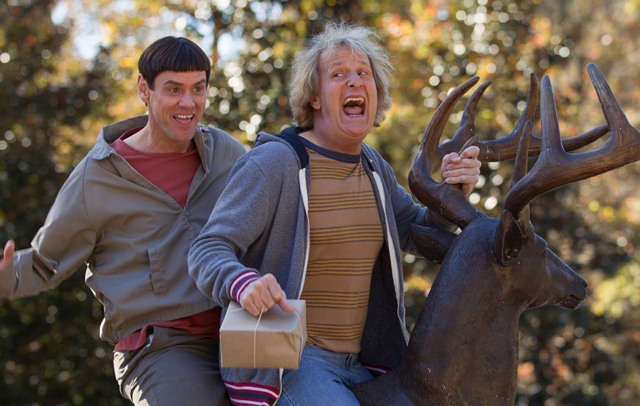 CHICAGO – “Dumb And Dumber To” is an exercise in diminishing returns. Jim Carrey and the Farrelly Brothers expend twice the effort for less than a third of the laughs. It benefits greatly from the enormous well of goodwill created by the original’s inspired idiocy. But one can only suspend disbelief for so long and this sequel has problems that the warm glow of nostalgia can’t solve. Picking up 20 years after the original, Carrey and Daniels head back out on the road to find the daughter Daniels never knew he had. The script – which is credited to six writers – uses the plot as the flimsiest of clotheslines on which to hang its physical gags. It’s less a movie than a string of punchlines in search of a decent setup. Some work, but many many do not. The first time Carrey pulls an elaborate fake out routine on Daniels it’s mildly amusing. The sixth time it happens its just plain lazy. Nostalgia proves to be its most reliable source of jokes – a high point is the fate of Billy the blind kid and his pet bird Siskel (a parrot who speaks in nothing but movie quotes).